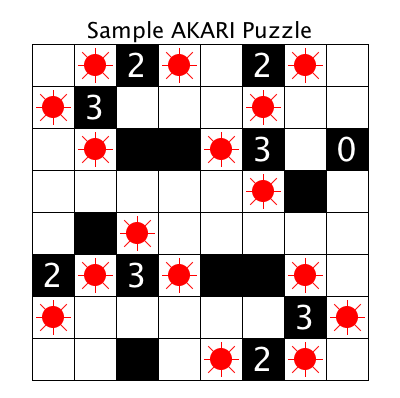 An AKARI puzzle consists of a square grid in which some of the cells are painted black in the same way as in a crossword puzzle. Think of it as the floor plan of a building in which the black cells represent pillars or wall segments. The remainder of the cells represent floor area which must be illuminated by lamps placed in certain of the cells. A lamp illuminates all cells in its row and column up to the edge of the puzzle, or up to an intervening black cell. No lamp is allowed to illuminate any other lamp, and the numbers in some of the black cells indicate the number of lamps which are adjacent to that cell both horizontally and vertically. Each puzzle has a unique solution which requires no guesswork. 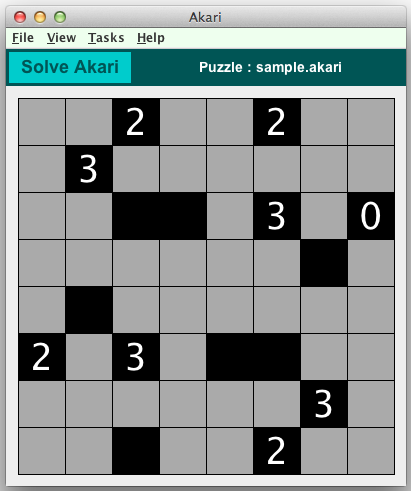 These graphics show a Akari puzzle in the Crossword Express Solve screen and a PNG graphic file produced by the program's print function, showing the complete puzzle solution. See also a full size version of a PDF file showing the complete solution. Fully automatic construction of puzzles. Puzzles are built on predefined grids. A number of suitable grids are provided with the program, but using Grid Maintenance, you can make an unlimited number of new ones.